This book is all about challenges and opportunities. 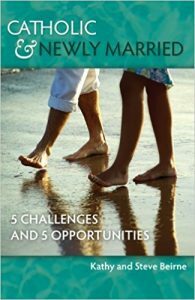 It outlines five challenges couples will experience as they begin to build their own marriage; it directly relates each challenge to an opportunity flowing from it. Thus, each challenge, difficult as it may be to handle, is viewed in a positive light because it offers the opportunity for couples to grow in rewarding ways. One challenge for a new wife and husband is to learn “to speak the same language,” despite their personality differences or tendencies to misunderstand each other’s words. This challenge offers the opportunity for couples to improve their communication skills. It is an opportunity to take steps to assure that a couple’s conversations, even about sensitive matters, are salted through with kindness, respect, attention, love, affirmation and gratitude. “No matter where you are on the communications scale – from poor to excellent – there is always an opportunity to improve,” the Beirnes advise readers. Again, there is the often stressful challenge of getting along with in-laws. This challenge offers couples the opportunity to recognize that their in-laws may well become “marriage-enriching” resources of support and understanding over time. It is through their in-laws, not incidentally, that a couple and their children frequently learn their family’s history and how they have been shaped by it. I am sure that many readers will appreciate the Beirnes’ perceptive, frank focus on the newly married couple’s challenge of learning to merge two different ways of “thinking about, handling and spending money.” To ignore “financial situations and differences” is to follow “a sure path to trouble,” they state. Developing clarity about financial goals will play a big role in curbing “impulse spending” in a marriage, the authors hold. What really stands out for me in this book, however, is its analysis of the challenge of intimacy. It is a misunderstanding for couples to think that “closeness” and “intimacy” are synonyms, the authors stress. After all, it is possible to be close to others without in any way being intimate with them. Real intimacy entails openness and vulnerability, as well as risk. The risk factor is real enough in marriage, since “if you are rejected by your spouse, the hurt can be immense,” the Beirnes write. Here the Beirnes’ advice to newly married couples is uncompromisingly clear: Don’t be that couple.